For other uses, see Crankshaft (disambiguation). A crankshaft—related to crank—is a mechanical part able to perform a conversion between reciprocating motion and rotational motion. In a reciprocating engine, it translates reciprocating motion of the piston into rotational motion; whereas in a reciprocating compressor, it converts the rotational motion into reciprocating motion. In order to do the conversion between two motions, the crankshaft has "crank throws" or "crankpins", additional bearing surfaces whose axis is offset from that of the crank, to which the "big ends" of the connecting rods from each cylinder attach. It is typically connected to a flywheel to reduce the pulsation characteristic of the four-stroke cycle, and sometimes a torsional or vibrational damper at the opposite end, to reduce the torsional vibrations often caused along the length of the crankshaft by the cylinders farthest from the output end acting on the torsional elasticity of the metal. Tibetan operating a quern (1938). The upright handle of such rotary handmills, set at a distance from the centre of rotation, works as a crank. The earliest hand-operated cranks appeared in China during the Han Dynasty (202 BC-220 AD). They were used for silk-reeling, hemp-spinning, for the agricultural winnowing fan, in the water-powered flour-sifter, for hydraulic-powered metallurgic bellows, and in the well windlass. The rotary winnowing fan greatly increased the efficiency of separating grain from husks and stalks. However, the potential of the crank of converting circular motion into reciprocal motion never seems to have been fully realized in China, and the crank was typically absent from such machines until the turn of the 20th century. A crank in the form of an eccentrically-mounted handle of the rotary handmill appeared in 5th century BC Celtiberian Spain and ultimately spread across the Roman Empire. A Roman iron crank dating to the 2nd century AD was excavated in Augusta Raurica, Switzerland. The crank-operated Roman mill is dated to the late 2nd century. Hierapolis sawmill in Asia Minor (3rd century), a machine that combines a crank with a connecting rod. Evidence for the crank combined with a connecting rod appears in the Hierapolis mill, dating to the 3rd century; they are also found in stone sawmills in Roman Syria and Ephesus dating to the 6th century. The pediment of the Hierapolis mill shows a waterwheel fed by a mill race powering via a gear train two frame saws which cut blocks by the way of some kind of connecting rods and cranks. The crank and connecting rod mechanisms of the other two archaeologically-attested sawmills worked without a gear train. Water-powered marble saws in Germany were mentioned by the late 4th century poet Ausonius; about the same time, these mill types seem also to be indicated by Gregory of Nyssa from Anatolia. A rotary grindstone operated by a crank handle is shown in the Carolingian manuscript Utrecht Psalter; the pen drawing of around 830 goes back to a late antique original. Cranks used to turn wheels are also depicted or described in various works dating from the tenth to thirteenth centuries. The first depictions of the compound crank in the carpenter's brace appear between 1420 and 1430 in northern European artwork. The rapid adoption of the compound crank can be traced in the works of an unknown German engineer writing on the state of military technology during the Hussite Wars: first, the connecting-rod, applied to cranks, reappeared; second, double-compound cranks also began to be equipped with connecting-rods; and third, the flywheel was employed for these cranks to get them over the 'dead-spot'. The concept was much improved by the Italian engineer and writer Roberto Valturio in 1463, who devised a boat with five sets, where the parallel cranks are all joined to a single power source by one connecting-rod, an idea also taken up by his compatriot Italian painter Francesco di Giorgio. The crank had become common in Europe by the early 15th century, as seen in the works of the military engineer Konrad Kyeser (1366–after 1405). Devices depicted in Kyeser's Bellifortis include cranked windlasses for spanning siege crossbows, cranked chain of buckets for water-lifting and cranks fitted to a wheel of bells. Kyeser also equipped the Archimedes' screws for water-raising with a crank handle, an innovation which subsequently replaced the ancient practice of working the pipe by treading. Pisanello painted a piston-pump driven by a water-wheel and operated by two simple cranks and two connecting-rods. The 15th also century saw the introduction of cranked rack-and-pinion devices, called cranequins, which were fitted to the crossbow's stock as a means of exerting even more force while spanning the missile weapon. In the textile industry, cranked reels for winding skeins of yarn were introduced. The non-manual crank appears in several of the hydraulic devices described by the Banū Mūsā brothers in their 9th-century Book of Ingenious Devices. These automatically operated cranks appear in several devices, two of which contain an action which approximates to that of a crankshaft, anticipating Al-Jazari's invention by several centuries and its first appearance in Europe by over five centuries. However, the automatic crank described by the Banu Musa would not have allowed a full rotation, but only a small modification was required to convert it to a crankshaft. Al-Jazari (1136–1206) described a crank and connecting rod system in a rotating machine in two of his water-raising machines. The author Sally Ganchy identified a crankshaft in his twin-cylinder pump mechanism, including both the crank and shaft mechanisms. According to historian Donald Routledge Hill, Al-Jazari invented the crankshaft. The Italian physician Guido da Vigevano (c. 1280−1349), planning for a new crusade, made illustrations for a paddle boat and war carriages that were propelled by manually turned compound cranks and gear wheels, identified as an early crankshaft prototype by Lynn Townsend White. The Luttrell Psalter, dating to around 1340, describes a grindstone which was rotated by two cranks, one at each end of its axle; the geared hand-mill, operated either with one or two cranks, appeared later in the 15th century. Around 1480, the early medieval rotary grindstone was improved with a treadle and crank mechanism. Cranks mounted on push-carts first appear in a German engraving of 1589. Crankshafts were also described by Leonardo da Vinci (1452–1519) and a Dutch farmer and windmill owner by the name Cornelis Corneliszoon van Uitgeest in 1592. His wind-powered sawmill used a crankshaft to convert a windmill's circular motion into a back-and-forward motion powering the saw. Corneliszoon was granted a patent for his crankshaft in 1597. First: Make sure the gear shifting lever is in neutral position. Second: The clutch pedal is unlatched and the clutch engaged. The brake pedal is pushed forward as far as possible setting brakes on the rear wheel. Third: See that spark control lever, which is the short lever located on top of the steering wheel on the right side, is back as far as possible toward the driver and the long lever, on top of the steering column controlling the carburetor, is pushed forward about one inch from its retarded position. Fourth: Turn ignition switch to point marked "B" or "M"
Fifth: Set the carburetor control on the steering column to the point marked "START." Be sure there is gasoline in the carburetor. Test for this by pressing down on the small pin projecting from the front of the bowl until the carburetor floods. If it fails to flood it shows that the fuel is not being delivered to the carburetor properly and the motor cannot be expected to start. See instructions on page 56 for filling the vacuum tank. Sixth: When it is certain the carburetor has a supply of fuel, grasp the handle of starting crank, push in endwise to engage ratchet with crank shaft pin and turn over the motor by giving a quick upward pull. Never push down, because if for any reason the motor should kick back, it would endanger the operator. Large engines are usually multicylinder to reduce pulsations from individual firing strokes, with more than one piston attached to a complex crankshaft. Many small engines, such as those found in mopeds or garden machinery, are single cylinder and use only a single piston, simplifying crankshaft design. A crankshaft is subjected to enormous stresses, potentially equivalent of several tonnes of force. The crankshaft is connected to the fly-wheel (used to smooth out shock and convert energy to torque), the engine block, using bearings on the main journals, and to the pistons via their respective con-rods. An engine loses up to 75% of its generated energy in the form of friction, noise and vibration in the crankcase and piston area. The remaining losses occur in the valvetrain (timing chains, belts, pulleys, camshafts, lobes, valves, seals etc.) heat and blow by. The crankshaft has a linear axis about which it rotates, typically with several bearing journals riding on replaceable bearings (the main bearings) held in the engine block. As the crankshaft undergoes a great deal of sideways load from each cylinder in a multicylinder engine, it must be supported by several such bearings, not just one at each end. This was a factor in the rise of V8 engines, with their shorter crankshafts, in preference to straight-8 engines. 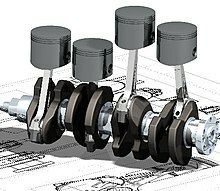 The long crankshafts of the latter suffered from an unacceptable amount of flex when engine designers began using higher compression ratios and higher rotational speeds. High performance engines often have more main bearings than their lower performance cousins for this reason. The distance the axis of the crank throws from the axis of the crankshaft determines the piston stroke measurement, and thus engine displacement. A common way to increase the low-speed torque of an engine is to increase the stroke, sometimes known as "shaft-stroking." This also increases the reciprocating vibration, however, limiting the high speed capability of the engine. In compensation, it improves the low speed operation of the engine, as the longer intake stroke through smaller valve(s) results in greater turbulence and mixing of the intake charge. Most modern high speed production engines are classified as "over square" or short-stroke, wherein the stroke is less than the diameter of the cylinder bore. As such, finding the proper balance between shaft-stroking speed and length leads to better results. The configuration, meaning the number of pistons and their placement in relation to each other leads to straight, V or flat engines. The same basic engine block can sometimes be used with different crankshafts, however, to alter the firing order. For instance, the 90° V6 engine configuration, in older days[when?] sometimes derived by using six cylinders of a V8 engine with a 3 throw crankshaft, produces an engine with an inherent pulsation in the power flow due to the "gap" between the firing pulses alternates between short and long pauses because the 90 degree engine block does not correspond to the 120 degree spacing of the crankshaft. The same engine, however, can be made to provide evenly spaced power pulses by using a crankshaft with an individual crank throw for each cylinder, spaced so that the pistons are actually phased 120° apart, as in the GM 3800 engine. While most production V8 engines use four crank throws spaced 90° apart, high-performance V8 engines often use a "flat" crankshaft with throws spaced 180° apart, essentially resulting in two straight four engines running on a common crankcase. The difference can be heard as the flat-plane crankshafts result in the engine having a smoother, higher-pitched sound than cross-plane (for example, IRL IndyCar Series compared to NASCAR Sprint Cup Series, or a Ferrari 355 compared to a Chevrolet Corvette). This type of crankshaft was also used on early types of V8 engines. See the main article on crossplane crankshafts. For some engines it is necessary to provide counterweights for the reciprocating mass of each piston and connecting rod to improve engine balance. These are typically cast as part of the crankshaft but, occasionally, are bolt-on pieces. While counter weights add a considerable amount of weight to the crankshaft, it provides a smoother running engine and allows higher RPM levels to be reached. In some engine configurations, the crankshaft contains direct links between adjacent crank pins, without the usual intermediate main bearing. These links are called flying arms. This arrangement is sometimes used in V6 and V8 engines, as it enables the engine to be designed with different V angles than what would otherwise be required to create an even firing interval, while still using fewer main bearings than would normally be required with a single piston per crankthrow. This arrangement reduces weight and engine length at the expense of less crankshaft rigidity. Some early aircraft engines were a rotary engine design, where the crankshaft was fixed to the airframe and instead the cylinders rotated with the propeller. The radial engine is a reciprocating type internal combustion engine configuration in which the cylinders point outward from a central crankshaft like the spokes of a wheel. It resembles a stylized star when viewed from the front, and is called a "star engine" (German Sternmotor, French Moteur en étoile) in some languages. The radial configuration was very commonly used in aircraft engines before turbine engines became predominant. Crankshafts can be monolithic (made in a single piece) or assembled from several pieces. Monolithic crankshafts are most common, but some smaller and larger engines use assembled crankshafts. Crankshafts can be forged from a steel bar usually through roll forging or cast in ductile steel. Today more and more manufacturers tend to favor the use of forged crankshafts due to their lighter weight, more compact dimensions and better inherent damping. With forged crankshafts, vanadium microalloyed steels are mostly used as these steels can be air cooled after reaching high strengths without additional heat treatment, with exception to the surface hardening of the bearing surfaces. The low alloy content also makes the material cheaper than high alloy steels. Carbon steels are also used, but these require additional heat treatment to reach the desired properties. Cast iron crankshafts are today mostly found in cheaper production engines (such as those found in the Ford Focus diesel engines) where the loads are lower. Some engines also use cast iron crankshafts for low output versions while the more expensive high output version use forged steel. Crankshafts can also be machined out of a billet, often a bar of high quality vacuum remelted steel. Though the fiber flow (local inhomogeneities of the material's chemical composition generated during casting) does not follow the shape of the crankshaft (which is undesirable), this is usually not a problem since higher quality steels, which normally are difficult to forge, can be used. These crankshafts tend to be very expensive due to the large amount of material that must be removed with lathes and milling machines, the high material cost, and the additional heat treatment required. However, since no expensive tooling is needed, this production method allows small production runs without high costs. In an effort to reduce costs, used crankshafts may also be machined. A good core may often be easily reconditioned by a crankshaft grinding  process. Severely damaged crankshafts may also be repaired with a welding operation, prior to grinding, that utilizes a submerged arc welding machine. To accommodate the smaller journal diameters a ground crankshaft has, and possibly an oversized thrust dimension, undersize engine bearings are used to allow for precise clearances during operation. Machine shops soak the crankshafts in a hot tank and power wash the overall shaft. The oil holes are then wire brushed. A magnetic particle inspection checks for cracks. The crankshaft is magnetized and sprayed with an iron oxide powder which, under blacklight conditions, makes any imperfections visible. The counterweights are removed, cleaned, and checked for cracks and tightness. The bolts of loose counterweights are replaced. The counterweights are then installed back into the crankshafts, which are inspected for damage. A machinist determines the size and hardness of the journals and mains. A technician checks the keyway, nose, and bolt holes, then seals the surface for non-conformities. Bolt holes are typically tapped ½” or less on remanufactured crankshafts. The bearings and the straightness of the crankshaft are also inspected, and it must be re-straightened with an industrial straightening machine if not up to OEM standards. The straightening machine determines how many dials are out of line. To re-straighten the shaft, technicians heat the crankshaft to 500-600 degrees. Any more than 700 degrees takes the hardness out of the shaft. The magnetic particle inspection is repeated after the crankshaft has been straightened. The counterweights and webbing are stamped in proper firing order (alpha if numeric and vice versa). Technicians then stamp the employee ID#, Work Order # and date on #1 rod webbing. Stamping this information on the rod webbing helps keep the quality control process order in case of future issues during the manufacturing process. Technicians undercut the rod or journals to eliminate wear before buildup. Further buildup and corrosion is typically prevented via thermal spraying, which involves protrusion of molten particles onto the heated metallic surface, forming a smooth coating interwoven into the structure. Typically, boron alloys are used for this process, as they are very dense, hard, and oxide-free. They prevent against abrasive materials that cause divots, scratches, and cracks, and prevent surface erosion and corrosion. The welding process for re-manufactured crankshafts is called submerged arc welding. It is a powdered flux plus a weld which combines to produce a more precise weld. The most common flux powder used is called #1 Flux 2245 HD. This powder eliminates the need for technicians to wear weld masking and reduces the amount of dust by-product. The crankshaft is once more heated to 500-600 degrees to relieve structural stress. Its overall straightness is also rechecked. If the re-manufactured crankshaft is out of alignment, then the technician must re-straighten the structure. Crankshaft grinding involves rough grinding the excess material from the rod or journals. On the rod there are various mains that need to be reground to proper OEM specifications. These rods are spun grind to the next undersize using the pultrusion crankshaft grinding machine. Rod mains are ground inside and outside. The technician then performs a finished crankshaft grinding procedure, which is a more precise grind which reaches the correct OEM specifications. Before the technician starts the crankshaft grinding they should see what crankshaft bearings are available and start from there. For example, the OEM specification for a Caterpillar 3306 Rod is 2.9987” – 3.0003”. Top industrial crankshaft grinding technicians always stop at the high end of the tolerance level. Shot peening adds an additional layer of hardness to the re-manufactured crankshaft. The counterweights are replaced in proper firing order. Either the new counterweights are installed or the old counterweight bolts are re-tightened. The machine shop then determines if the proper rotational balance of the re-manufactured crankshafts is achieved. In the engine, the crankshaft, pistons, and rods are all in a constant rotation. The counterweights are designed to offset the weight of the rod and the pistons. When in motion, the kinetic energy and the sum of all forces should be equal to zero on all moving parts. If the counterweights are imbalanced, it adds additional stress on other components of the engine. The technician must ensure that the internal and external balance of the crankshaft counterweights are properly aligned. The technician micro-polishes each of the rebuilt crankshafts by hand. To further refine the crankshaft grinding process the machinist makes the most precise fit by micro-polishing the component with a 600-grit emery cloth. Through micro-polishing and industrial crankshaft grinding, the machine shop achieves the recommended Rockwell hardness and Ra finish (Roughness Parameter). Industry standard crankshaft hardness is 40 on the Rockwell hardness scale. A 45-50 rating is what most reputable machine shops try to employ for all remanufactured crankshafts. Typically, hardness can be reduced if the engine is out of oil or the journal is spun incorrectly. Quality control inspects all of the finished crankshafts mistakes. A typical quality control department uses separate testing and analytical measurement tools from the technicians to ensure accuracy. The remanufactured crankshafts are then rustproofed using Cosmoline and packaged in damage-proof coverings. Microfinishing is a method of finishing the surface of the crankshaft in such a manner that microscopic roughness, pitting or cracking is reduced to a smooth, integral surface. Crankshafts fail by fatigue cracking and cracks start at the most highly stressed point in the material, which is the surface. Once a crack has developed, it increases the local stress in the area at its 'V' point, which slowly increases the size of the crack. The objective of microfinishing is to reduce to the smallest number and size any deviation in the surface and thus minimize the opportunity for cracks to develop. Increased requirements on microfinishing has become a common requirement as Industries are moving towards lead-free bearings. Improved performance and longevity are associated with the microfinishing requirements. The fatigue strength of crankshafts is usually increased by using a radius at the ends of each main and crankpin bearing. The radius itself reduces the stress in these critical areas, but since the radius in most cases is rolled, this also leaves some compressive residual stress in the surface, which prevents cracks from forming. Most production crankshafts use induction hardened bearing surfaces, since that method gives good results with low costs. It also allows the crankshaft to be reground without re-hardening. But high performance crankshafts, billet crankshafts in particular, tend to use nitridization instead. Nitridization is slower and thereby more costly, and in addition it puts certain demands on the alloying metals in the steel to be able to create stable nitrides. The advantage of nitridization is that it can be done at low temperatures, it produces a very hard surface, and the process leaves some compressive residual stress in the surface, which is good for fatigue properties. The low temperature during treatment is advantageous in that it does not have any negative effects on the steel, such as annealing. With crankshafts that operate on roller bearings, the use of carburization tends to be favored due to the high Hertzian contact stresses in such an application. Like nitriding, carburization also leaves some compressive residual stresses in the surface. Some expensive, high performance crankshafts also use heavy-metal counterweights to make the crankshaft more compact. The heavy-metal used is most often a tungsten alloy but depleted uranium has also been used. A cheaper option is to use lead, but compared with tungsten its density is much lower. In a paired counter-rotating crankshaft arrangement, each piston is connected to two crankshafts so lateral forces due to the angle of the connecting rods cancel each other out. This reduces piston-cylinder friction and therefore fuel consumption. The symmetrical arrangement reduces the requirement for counterweights, reducing overall mass and making it easier for the engine to accelerate and decelerate. It also eliminates engine rocking and torque effects. Several counter-rotating crankshaft arrangements have been patented, for example US2010/0263621. An early example of a counter-rotating crankshaft arrangement is the Lanchester flat-twin engine. Wikimedia Commons has media related to Crankshaft. ^ Needham, Joseph. (1986). Science and Civilization in China: Volume 4, Part 2, Mechanical Engineering. Taipei: Caves Books, Ltd. Pages 118–119. ^ Bautista Paz, Emilio; Ceccarelli, Marco; Otero, Javier Echávarri; Sanz, José Luis Muñoz (2010). A Brief Illustrated History of Machines and Mechanisms. Springer (published May 12, 2010). p. 19. ISBN 978-9048125111. ^ Du Bois, George (2014). Understanding China: Dangerous Resentments. Trafford on Demand. ISBN 978-1490745077. Yet a student of the Chinese technology of the early twentieth century remarks that even a generation ago the Chinese had not 'reached that stage where continuous rotary motion is substituted for reciprocating motion in technical contrivances such as the drill, lathe, saw, etc. To take this step familiarity with the crank is necessary. The crank in its simple rudimentary form we find in the [modern] Chinese windlass, which use of the device, however, has apparently not given the impulse to change reciprocating into circular motion in other contrivances'. In China the crank was known, but remained dormant for at least nineteen centuries, its explosive potential for applied mechanics being unrecognized and unexploited. ^ Schiöler 2009, pp. 113f. Because of the findings at Ephesus and Gerasa the invention of the crank and connecting rod system has had to be redated from the 13th to the 6th c; now the Hierapolis relief takes it back another three centuries, which confirms that water-powered stone saw mills were indeed in use when Ausonius wrote his Mosella. ^ Mangartz 2006, pp. 579f. ^ Hägermann & Schneider 1997, pp. 425f. ^ Needham 1986, pp. 112–113. ^ Needham 1986, p. 113. ^ Hall 1979, pp. 74f. ^ a b Ahmad Y Hassan. The Crank-Connecting Rod System in a Continuously Rotating Machine. ^ Townsend White, Lynn (1978). Medieval Religion and Technology: Collected Essays. University of California Press. p. 335. ISBN 9780520035669. ^ Nunney 2007, pp. 16, 41. ^ "Crankshaft Grinding". Crankshaft Repair. ^ "Remanufactured Crankshafts - Capital Reman Exchange". Capital Reman Exchange. Retrieved 2015-12-28.